The Board of Regents of the University System of Georgia was created in 1931 as a part of a reorganization of Georgia's state government. With this act, public higher education in Georgia was unified for the first time under a single governing and management authority. The governor appoints members of the Board to a seven year term and regents may be reappointed to subsequent terms by a sitting governor. Regents donate their time and expertise to serve the state through their governance of the University System of Georgia – the position is a voluntary one without financial remuneration. In 2011, Governor Nathan Deal announced the Complete College Georgia initiative, a collaborative effort among Georgia’s K-12 schools, public colleges, universities and technical colleges, and the private sector to take concrete steps to improve college access and completion in the state. Framed on a set of high impact strategies organized around nine goals, the initiative builds on national research and local activities to support student success at all levels. The overarching goal is to graduate an additional 250,000 Georgia students with high-quality degrees or certificates by 2025 in order to reach projections of employment readiness. In 2011, each institution in the University System of Georgia and Technical College System of Georgia created action plans on the policies and procedures that they could implement to have the greatest impact on college completion within their institutional mission and context. Complete College Georgia (CCG) has developed into a framework for focusing institutional attention on what matters most: helping Georgia’s students succeed. Institutions have adopted, adapted, and promoted a wide range of strategies to suit their local settings. More importantly, the work of promoting student success has become much more broadly shared on campus and better understood across the units of institutions. Forging partnerships among functional areas and fostering understandings of how the various elements of a college or university come together for students have helped to support Georgia’s orientation toward building a 21st century workforce. The University System of Georgia (USG) includes 28 institutions, with fall 2016 enrollment of 321,551 students. Academic year 2016 marked the second consecutive year that enrollment in the University System has exceeded the recession peak (fall 2011—318,027) and is an increase of 3,387 or roughly 1 percent, over fall 2015. The increase in enrollment at USG institutions compares favorably with national trends, with four-year public institutions nationally experiencing almost no growth in enrollment in the past year. Over the past five years, the number of Hispanic students has increased by 37 percent and the percentage of Asian students has increased by 25 percent. Black or African American enrollment declined by more just less than 1 percent and white enrollment declined by under 4 percent over this same period. 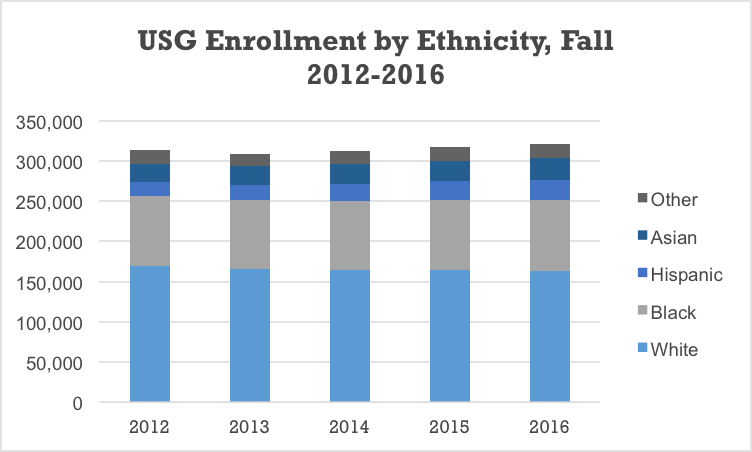 Figure 1 illustrates the shifting composition of students enrolled in USG institutions. The University System’s mission is to create a more educated Georgia. Census data from 2016 indicate that 39.1 percent of young adults (ages 25-34) and nearly 40 percent of all working age adults (age 25-64) possess at least an associate’s degree. Twenty-one percent of working age Georgians—well over a million—indicate that they have some college, but no degree. 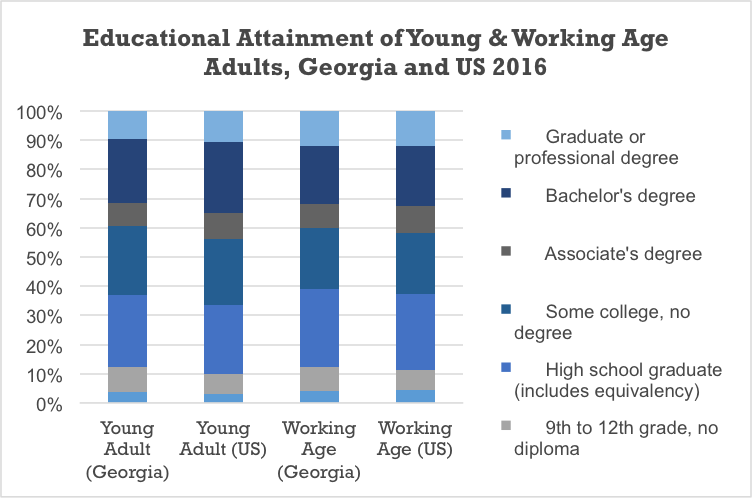 Georgia’s young adult population has educational attainment levels above the national average for associate degrees and higher, but across the working age population, the situation is reversed, with working age Georgians falling behind the national average. See Figure3. Georgia’s educational attainment rates have improved over the past five years, due in part to degree conferrals at all levels rising by 18 percent since the 2011 Academic Year. In order to reach the CCG goals for higher education completions by 2025, the state must graduate an additional 3% of students annually, over and above previous years. While the state has been able to exceed its goals for degree production since the announcement of the CCG initiative in 2011-2012, demographic and economic trends underscore the significant work still needed to maintain the state’s momentum. Enrollments, which swelled during the recession, declined as the economy recovered, most especially among non-traditional students. The shift in enrollment patterns reinforces the importance of student persistence and retention to meeting the state’s overall attainment goals. 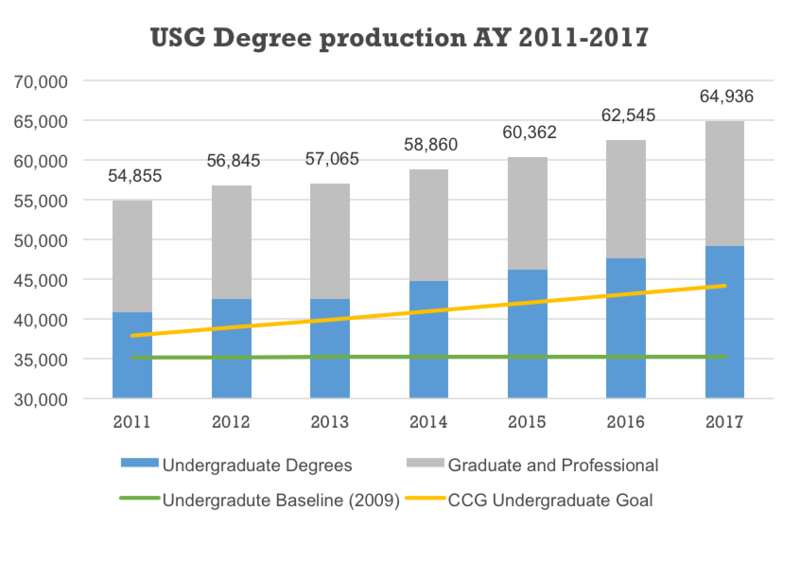 The figure below provides a view of degree production by sector from 2012 to 2017 compared to the 2009 baseline and CCG goal. Students are increasingly turning to online and hybrid learning models to advance and accelerate progress toward their degrees. Institutions across the System have a variety of strategies related to this work, some directed independently, others in coordination with eCore, the University System’s collaborative online learning environment. As a statewide initiative, eCore is instrumental in taking important steps toward identifying and serving targeted populations and partnering with other collaboratives to create seamless pathways by increasing the array of online options. The eCore program has an important role in the Complete College Georgia plan to accelerate the number of college graduates in the upcoming years. As a USG collaborative, eCore is dedicated to acknowledging and addressing economic realities while focusing on the creation of a student culture of connection and quality. eCore provides accessible, flexible, and affordable higher education course options that support CCG initiatives. Finally, eCore relieves class-scheduling conflicts by increasing institutional core course capacity. eCore offers adult learners, with family and job responsibilities, flexible options for higher education attainment. In addition to eCore, institutions offer online courses as well, extending the online learning ecosystem considerably. In 2016, undergraduate enrollment exceeded 65,000 students, the vast majority of whom enroll in a mix of online and in person courses. Growth in online course taking has been dramatic, with more than 50,000 students taking at least one course online in 2016. Advising is the critical point of contact between students and the institution. Robust advising systems can take many forms, including “all professional,” “all faculty,” and “blended advising.” Advisors connect students with the often complex structure and policies of higher education, and are especially critical for the success of first generation, low income, and adult learners for whom college poses special challenges. There exists across institutional sectors a renewed focus on training and professional development for advisors to improve their skills and facilitate better interactions with students. Also, as technology has advanced and the benefits of business intelligence and customer relationship management tools have been adapted for higher education, many institutions have become interested in adopting these tools. There remain, however, significant inconsistencies across institutions in the degree to which advisors are able to access, analyze and harness the data that is generated by students on their campuses about their learning and progression. In the year ahead, meeting this challenge will be a major focus. During 2016, CCG staff conducted site visits to institutions to identify promising practices in advising and student support services, sharing this information with institutions and the professional advising community. In the most recent survey of institutions, the prevalence of advising as a strategy is demonstrated by the expansion of approaches institutions are using. For example, all institutions now implement some system for tracking students’ progress toward a degree and use this information to identify students who may be in need of special interventions. Staff conducting interventions at most institutions are now able to review the student’s complete academic record, and more than have of USG institutions are using some form of predictive analytics to identify students who are off track and understand their likelihood of success in their program. Program maps are tools to help students better understand their path to a degree. Structured as semester-by-semester outlines of the courses a student must take in a program of study, maps feature a logical sequence of courses that, if a student stays on the map, will get them to graduation on time. Maps include the appropriate, aligned math course and first English course in the first term, an exploration of the discipline and restrict student elective choices to those that will support or expose them beneficially to skills needed in their chosen field. Twenty institutions across the system report having program maps for their students for each academic program, nine of which have at least three courses in a discipline included in the map to expose students to their discipline. These maps are also useful in predicting course loads and helping to relieving course availability bottlenecks to improve student on-time completion and lower credits at graduation. Optimally, program maps offer students an overview of the expectations and demands of a particular degree program; indicate clear, term-by-term guidance for the courses they must take and when, outlining any prerequisites along the way, and offer recommendations for electives from outside the program that complement or support courses from within the discipline. Maps should be designed so that students complete their first math and English courses and three courses in their identified field in their first year, and include a minimum of 30 credits. An additional imperative from the recent year has been to align gateway math courses with the program of study. Extensive work by the Academic Advisory Committee on Mathematical Subjects resulted in a recommendation that students pursuing programs that do not include some Calculus be encouraged to pursue either Quantitative Reasoning or Math Modeling rather than College Algebra. Both of these options include appropriate levels of algebra, but provide a more appropriate foundation for students whose academic pathways lead toward statistics rather than Calculus. Combining these two elements, Complete College Georgia convened two statewide meetings in 2016 to review best practices around program maps aligned with appropriate math pathways. The results of these meetings was a broad sharing of program maps across institutions, concerted efforts on a number of campuses to revise and coordinate existing program guidance for students, and an increased awareness of the content, rigor and function of non-College Algebra gateway math courses. Dual and jointly enrolled students at University System institutions have increased by 181% since 2011 as a result of legislative and policy changes that supported student participation in the program, renamed Move On When Ready in 2015. The vast majority of students pursue either three or six credits a term, although higher course taking loads have increased since 2013. In all students in dual enrollment (including Move on When Ready, Joint Enrollment and Early College) attempted 74,488 credit hours in 2016-2017 (not including summer), up from 37,367 in 2013-2014. All institutions report some dual enrollment on their campuses, with half also conducting courses on high school campuses or third locations with institutional faculty. The growth of these programs has lead to the establishment of identified program coordinators on nearly every campus to conduct outreach to high schools, coordinate programs with the institution, and generally serve as a point of contact for students interested in participating in the program. Significantly, institutions report increased matriculation of students who participate in dual enrollment at their institutions, indicating that in addition to providing students with the benefit of college-level courses while in high school, the program is encouraging enrollment at some institutions after graduation. The charts below provide an overview of credits earned and credit-taking patterns for dual enrollment students in the USG. In fall 2016, nearly 18 percent of the incoming freshman class were to USG institutions with deficiencies in English language and mathematics that require remediation or learning support in order for them to be successful at the collegiate level. Traditionally, entering students complete an assessment for readiness after admission, with those requiring remediation placed in basic skills or developmental course(s) that do not earn collegiate credit, but for which the student paid tuition. The great majority of these students did not persist to graduate from college; indeed, most did not complete the remedial course(s) required of them and left college without degrees. Remediation, for one fifth of the student population, was more an off-ramp than on-ramp to post-secondary success. Beginning in 2014, the University System began to transform the manner in which remediation was delivered, piloting a corequisite (rather than prerequisite) approach that offers “just-in-time” learning support to students as they pursue the gateway collegiate course. Instead of one- or two-course sequences of basic skills in the subject before a student engages with college-level (and credit bearing) work, the corequisite model places students directly into these college credit bearing courses alongside other students who are do not have learning support requirements. Evidence from this initial pilot implantation supported a more comprehensive implementation in 2015, with all institutions offering learning support asked to place at least half of all students requiring learning support in this model. Results from this first year were extremely promising, with students requiring learning support passing gateway courses at substantially higher rates in corequisite learning support than under previous remediation or under the newly reorganized prerequisite course (renamed in 2014 Foundations). The 2016 academic year represents the second year for corequisite remediation. There was a recognition at the outset that institutions had adopted a wide range of implementation approaches, with a considerable amount of variability in placement, course design and alignment, instructional delivery, course logistics, and much more. The degree to which institutions had adopted the core features of the model to suit their institutional situations provided a unique laboratory for testing propositions about best practices. Because the model was generally much more successful than other approaches, the heterogeneity reinforced the advantages of directing students into collegiate level courses immediately as well. For students in higher education, more so than perhaps any other group, time is truly money. Financial aid policies have established 12 hours as a full time course load at the undergraduate level, even though a student taking that many credits a semester will require at least an extra term to complete an associate degree and an additional year for a bachelor’s degree. By emphasizing 15 credits as full time, credit intensity programs help students get on track to graduate on time. In so doing, students save the costs associated with the additional time in school and can get into the workforce and begin earning money sooner. Additionally, evidence from Georgia and elsewhere indicates that students who attempt more credits in a term experience greater success, findings that are not isolated to the most prepared students. Institutions across the state have been enthusiastic about the potential for this strategy. In 2016-2017, 20 institutions reported formal credit intensity programs, with more than half of these providing information on the benefits of attempting more than 30 credits a year to students at registration or orientation, and slightly more (12) defaulting students into full time course schedules. A significant strategy for many (N=19) institutions is the use of summer semester as a strategy to remain on track for on-time graduation. Over the past five years, the percentage of undergraduates who attempt 15 or more credits in their fall semester has increased by 4 percent, with most of this increase appearing in a drop in the percentage who attempt between 12 and 14 credits. Spring term credit intensity has risen by 3.1 percent over this same period. This reflects an overall positive durability to institutional efforts, which are most intensively focused at first time freshmen, and most commonly during their first term on campus. 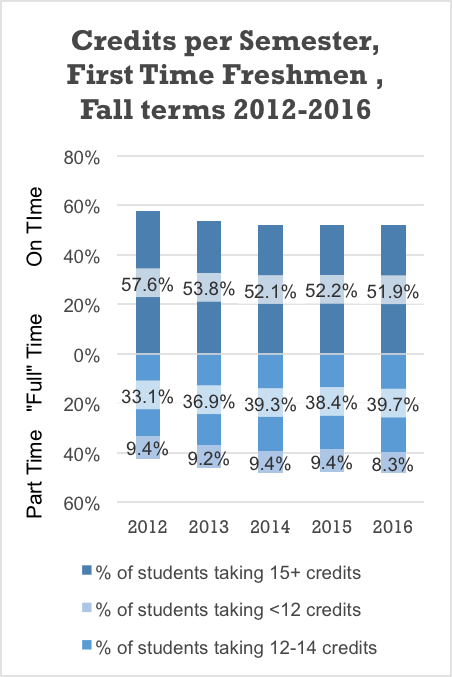 Somewhat discouragingly, the trend among incoming full time freshmen is the opposite, with recent cohorts of fall freshmen showing little growth in the share taking more than 15 credits, and a slight decline from 2012. 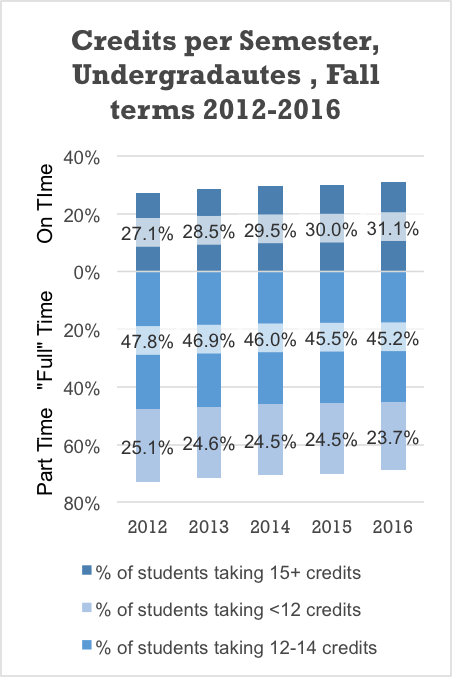 Even with this, the percentage of freshmen attempting a course schedule that would have them graduate on time is above 50 percent (51.9 percent in Fall 2017), and remains near that level in the spring terms. See figures 1 and 2 below. One important lesson from the system work in this area has been the power of a default schedule to incentivize student behavior. When institutions have implemented a credit intensity program that includes only marketing and outreach activities, even when that outreach is “high touch” advising, institutions appear to hit a ceiling on the share of students who will attempt greater credit intensity. Coupled with default schedules that include 15 credits and that require positive action on the part of the student (such as meeting with an advisor) to deviate from the schedule, these programs can achieve upwards of 70 percent of more students attempting 15 or more credits. Moreover, evidence indicates that this first semester course intensity persists for many students beyond their first year. In order to meet Georgia’s ambitious goals for higher education attainment, the state must reach students who traditionally have not been served by higher education. Reaching low-income students and working age adults means serving students with a host of that are often unfamiliar for institutions, including childcare, food insecurity, homelessness, transportation issues, and a host of financial considerations for life beyond the classroom that have an impact on student persistence and success. Complete College Georgia convened institutions for a two-day workshop during which they reviewed the results of an extensive self-assessment tool created by the Lumina Foundation to uncover how they currently addressed a variety of financial issues for low-income students, the degree to which services for students were integrated on campus, and areas for improvement. The self-assessment guide served as a tool to gauge the institutional profile with respect to low-income students and provided a platform for developing a plan of action for strengthening support for these populations, and students at all income levels. Among the activities related to this work that were completed in 2016-17 was a student services clearinghouse for students developed collaboratively by the University of North Georgia and Georgia Gwinnett College. The Georgia College Care Resource provides links to resources in 11 areas for all of North Georgia, serving as a single repository for referrals for services and providers in a wide area of North Georgia. Understanding that instruction is at the heart of what our institutions do to fulfill the mission of the University System as a whole, CCG recognizes the transformative potential of validated high impact practices to improve student learning and engagement, fostering better outcomes and richer experiences throughout students’ academic careers and beyond. Institutions across the state have engaged in this work in a variety of ways. Georgia is a participant in the Liberal Education and America’s Promise (LEAP) initiative, joining with 19 other states, state systems and consortia to support large scale collaboration around connecting quality of student learning with equity in student learning outcomes. Additionally, an initial cohort of ten institutions participated in a course redesign project lead by the John Gardner Institute, Gateway to Completion (G2C). The three-year project focuses on redesigning courses that are gateways to programs or degrees that also have high D-F-W rates. The faculty-focused process undertakes a thorough, guided review of the identified courses with an eye to rebuilding them around improving student learning and success. Georgia is the first system-wide application of the G2C process. Other high impact practices that have been widely adopted by institutions include first year experiences (25 institutions), undergraduate research (25 institutions), capstone courses or projects (25 institutions), internships (24 institutions), service learning or community-based learning (23 institutions), peer supplemental instruction (22 institutions), collaborative assignments and projects (21 institutions), and learning communities (18 institutions). 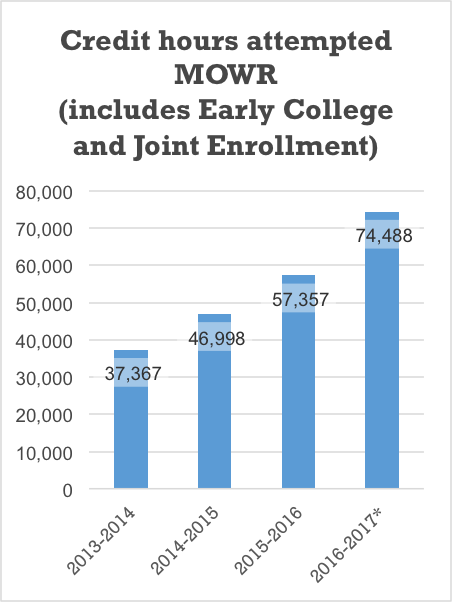 After five full years of implementation, Complete College Georgia has demonstrated some substantial gains. Campuses have institutionalized a number of strategies for success over the past few years, embedding corequisite remediation, credit intensity, credit for prior learning, and dual enrollment into the fabric of the institution. As these activities have matured, new and enhanced approaches to investigating equity gaps, holistic supports for students, academic advising, the application of data and analytics to support student success, program maps, and workforce alignment have emerged as priorities for campus engagement. While institutions across the state have demonstrated success in a range of areas, retention rates and progression to graduation remain lower than needed to ultimately meet the state’s achievement goals, especially among low-income and underserved populations. At its heart, Complete College Georgia remains a data driven process that places student success at the heart of institutional focus. Reflecting on the progress of the program since its inception and projecting the future path for CCG highlights the need to develop new approaches to getting students on the path to a degree, removing obstacles that might derail their efforts, and supporting students in new ways. In the coming years, the System Office will be committed to a multiyear effort to ensure students gain momentum directly from their first steps on campus. To do so, institutions will be asked to retire stand alone, prerequisite remediation, develop plans to have students make a purposeful choice of an academic focus areas or program of study upon enrollment, create in every student a productive academic mindset, and ensure that all students in their first year pursue a course of study that includes English and aligned math, nine credits in a focus area, and 30 credits in the first year. Together this structured support will give students the momentum needed to advance and thrive.